This has prompted many significant private partnerships and cooperative efforts to ensure the protection of this valuable population. In the last five years we have started seeing nice size grayling in the middle sections of the river, again proving that conservation does work. Starting with several sections above the town of Wise River we float what we consider to be nine different all-day float/wade sections. In seven of those nine sections the scenery and water structure are different, so it feels like you're fishing seven different rivers. Every year, in the first part of May, there is a tremendous Mothers Day Caddis Fly hatch and sometimes the hatch is so thick it's even hard to see the water. 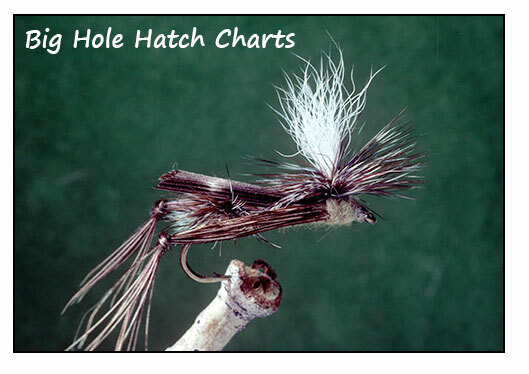 The Big Hole's mid-June emergence of the famous "Salmonfly Hatch" starts off the summer fishing season in earnest. The chance to throw two-inch -long dry flies for trout averaging eighteen inches is a rare treat many anglers anticipate. Fishing above and below the "Salmonfly Hatch" can be extremely productive fishing with Salmonfly nymphs. This also can greatly extend the time frame for being there exactly at the right time when the "hatches on". Dry fly fishing for rainbows and browns continues in July, August and September with prolific hatches of caddis, mayflies and lesser stoneflies. During August, the Big Hole river is seeing lots of grasshoppers, ants and other terrestrials that can provide excellent and exciting action as well. This is a great time to use a hopper/dropper combination. In late August and in September Tricos blanket the river in the mornings, while the afternoons can provide tremendous caddis hatches. The first freeze of autumn occurs in early September, cooling the waters and is the time the big Browns prepare for spawning, their color matching the golden-turning cottonwood trees along the riverâ€™s banks. For those anglers who love to throw streamers, this is a very productive and exciting time of the season. Then in October, the Big Hole river provides excellent fishing using nymphs, Caddis and Red Quill imitations during the warm Indian summer days. During this time the trees, like the Brown Trout, wear the brilliant colors of fall. Combining great fishing with ever-changing beautiful scenery makes the Big Hole River a special angling experience, Be sure to take your camera along for times when you may encounter moose blocking your path in the river; Bighorn Sheep grazing at the river's edge; Golden and Bald eagles close by in trees and the many deer and elk grazing in the meadows along the river banks. The camera also comes in handy for taking great photographs of your fish. Note** Lewis and Clark upon discovering the river, named it the Wisdom River after one of the three virtues that Pres. Thomas Jefferson used in his writings.